Need an all-in-one wireless P.a. solution for your next gig, assembly or corporate event? 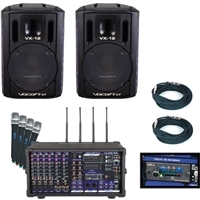 VocoPro's all new Pa-Pro 900 is sure to fit the bill. With 6 input channels, 900W power amplifier, and 4-channels of UHF wireless expandability, this versatile powerhouse can handle a multitude of applications. It's the perfect unit for schools, churches & rentals. The Hybrid-Play-16 is VocoPro's latest entry in quality and reliable microphone sets. 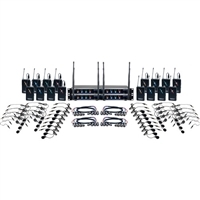 It's a 16 channel wireless package configured with clip-on bodypacks to use headset and lapel microphones, whichever your situation may require. Operating in the 900Mhz band, the Hybrid-Play-16 is unaffected by the TV Broadcast interference that plagues other microphones on the market! And its professional quality 24-bit digital audio will be heard clearly across its entire 200' range thanks to VocoPro's digital "mic-on-chip" technology and proven analog transmitter. The Hybrid-Play-16 is show ready with a balanced XLR output for each channel, allowing for minute volume control; or patch in all of the microphones quickly with the four 1/4" mixed outputs. With 16 microphones available, accommodating even the largest groups will be a breeze! Simplify your microphone set up with the latest microphone package, the Hybrid-Play-16 by VocoPro! The Digital-Conference-16 is Voco Pro's latest edition in quality and reliable microphone sets. It's a 16 channel wireless system configured with conference microphones. Operating in the 900MHz band, the Digital-Conference-16 is unaffected by TV broadcast interference that normally plagues other microphones on the market. Its professional quality 24-bit digital audio will be heard clearly across its entire 200ft range thanks to Voco Pro's digital Mic-On-Chip technology and proven analog transmitter. The Digital-Conference-16 is show ready with a balanced XLR output for each channel, allowing for minute volume control; or patch in all the microphones quickly with the four 1/4" mixed outputs. With 16 microphones available, accommodating even the largest groups will be a breeze! Simplify your microphone set up with the latest microphone package, the Digital-Conference-16 by Voco Pro. 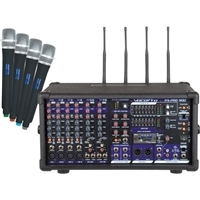 24-Bit Digital Wireless, 900 MHz Band Avoids TV Channels, 16 x Wireless Handheld Mics, Simple Setup and Operation, 4 x Four-Channel XLR Snakes, Rackmount Kit Included. 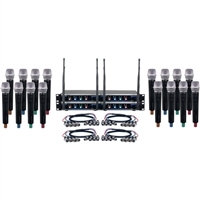 Featuring sixteen handheld microphones the Acapella-16 wireless system from VocoPro combines the convenience of simple set up & easy operation with the signal quality of 24-bit digital technology. It operates free from TV signal interference in the 900 MHz band with a transmission range of up to 200' and is well suited for groups of singers or speakers on stage in houses of worship or event halls. The system includes four four-channel receivers with discrete balanced XLR outputs for each microphone and a 1/4 mixed output. Individual microphone channels feature a dedicated volume control an RF LED that lets you know when the mic is on and an AF LED which flashes when audio is received. The handheld microphones are equipped with an on/off button & an LED battery indicator and are powered with two AA batteries. The VocoPro PA-PRO TRIO 900W Professional P.A. Mixer Package features a built-in compressor for microphone channels, and a dual-mode amplifier that can output in mono + monitor or stereo modes. 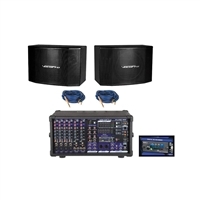 This package includes an SDR-3 Digital SD Recorder, 4 UHF Wireless Mics and Modules, 2 VX-12 Speakers, and 2 PTP-30 Speaker Cables.